Some dog breeds thrive in the winter. Among the most common cold-weather dogs are the Siberian Husky, Newfoundland, Alaskan Malamute, and Bernese Mountain Dog. For most of the other breeds, however, some adjustments and special care need to be made in the winter to make sure they stay in shape. A dog waiting for his breakfast. Photo by tracydonald. (CC BY 2.0). The typical recommendation is to increase food portions during the winter but the right thing to do really depends on each individual dog. Theoretically, dogs burn more calories in the winter just because of the extra effort to keep warm. Because of this, it might be a good idea to give them a little bit more food. However, many dogs also tend to hibernate in very cold weather. So while their body uses up extra energy to keep warm, they might not need extra food because they are less active. In fact, some dogs might need to be given less food, depending on how they behave during the season. 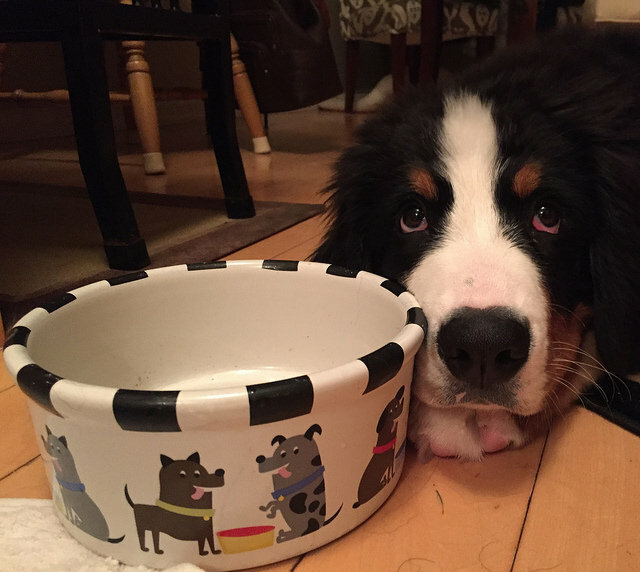 No matter what, you may need to adjust your dog’s food portions during the winter. Whether you’ll need to increase or decrease the amount really depends on your dog. The best thing to do is to observe your dog’s activity level and appetite and respond accordingly. It might also be a good idea to consult with your vet regarding these changes. 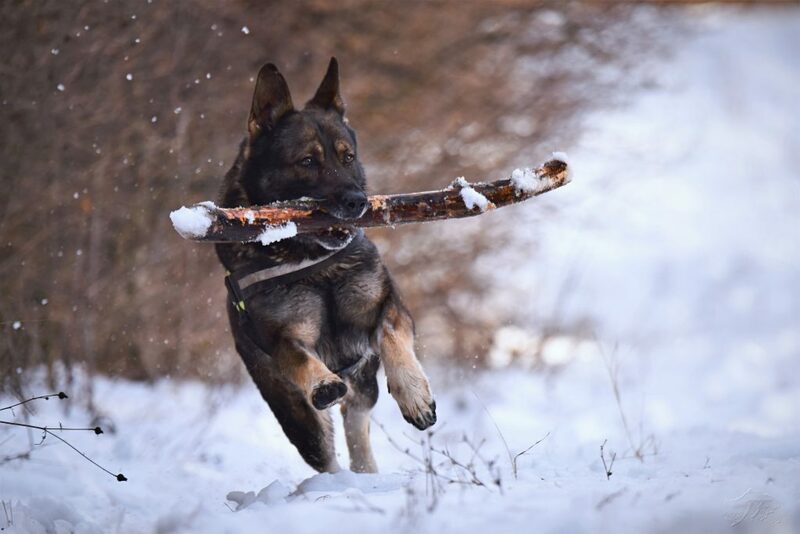 A German Shepherd playing fetch with a large stick during winter. Photo by Jozef Fehér. (CC BY 2.0). In winter, it’s easy to hole up indoors and it’s tempting to let our dogs do the same. But, it’s important to keep them active at this time. Besides, ensuring that your dog is adequately exercised will also help you be up and about, keep yourself in shape, and breathe some fresh air. 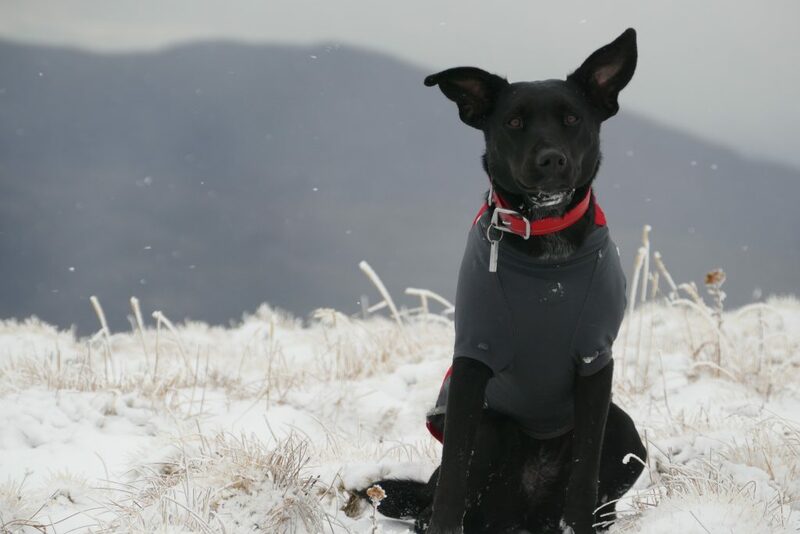 Exercising your dog in winter is much like any other season. The goal is simply to let them burn their excess energy to manage their weight and also so that they don’t develop any destructive behaviors. The best activities to exercise your dog are done outdoors. However, the different conditions in winter require you to make certain changes to ensure that your dog is safe and comfortable outside. A dog a body wrap to protect from the cold. Photo by Yuki Dog. 1) Use body wraps for insulation. 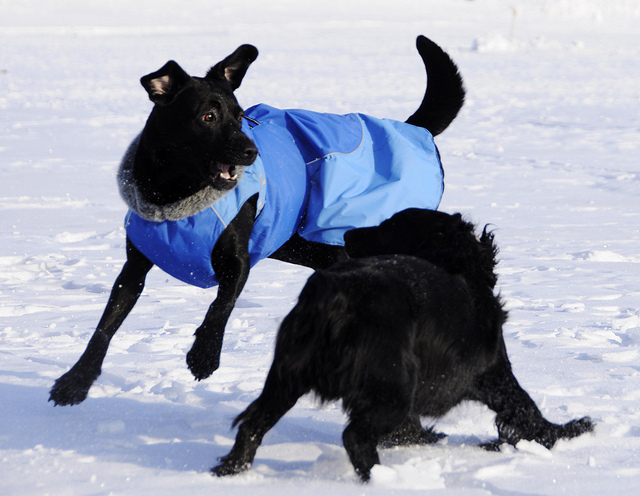 While dogs with dense coats should be fine outdoors during winter, most will need some help keeping themselves sufficiently warm. Body wraps or winter coats for dogs should be helpful for this purpose. Additionally, the different styles these coats come in makes bundling them up incredibly fun! A dog with a waterproof jacket playing in the snow. Photo by smerikal. (CC BY-SA 2.0). 2) Use waterproof jackets to protect from snow and rain. Sometimes, clothing dogs in winter is not really about providing extra insulation but protecting their coats from getting wet with cold rain or snow. This is especially true for thicker, longer-coated dogs like Goldendoodles. In these cases, dog raincoats or waterproof jackets should be very useful. These protect from wetness, are made of lighter material, and are generally easy to put on and off. 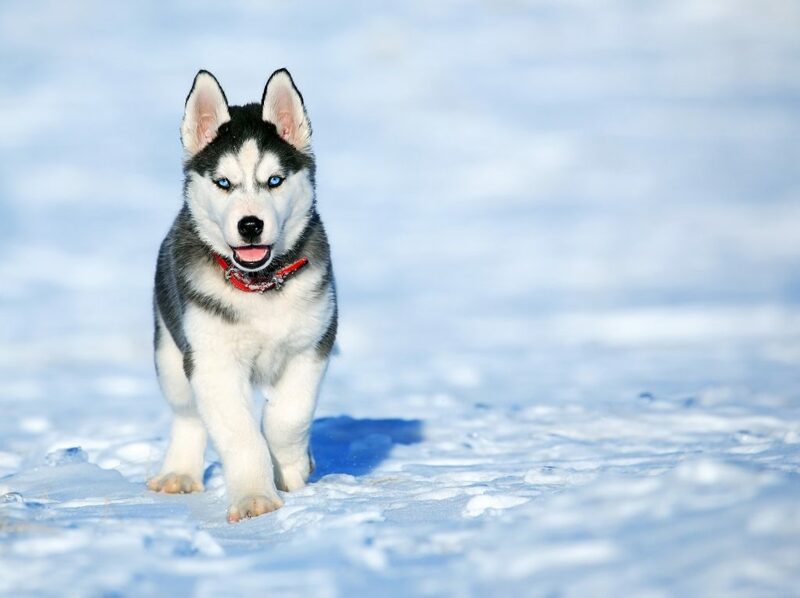 A Siberian Husky with a reflective collar in the snow. Photo by pixabay.com. 3) Use reflective collars for added safety. In the winter, it’s generally darker outside and light from the sun disappears quite early. Part of keeping your dog safe is making sure they’re visible at all times. Reflective collars should be very useful for this purpose. These are stylish at daytime and offer safety at night. Additionally, there are LED collars for even better visibility. A pug in winter clothes and dog shoes. Photo by pasja1000. Not all dogs will put up with them but dog boots are the best way to protect the paws from the cold ground. Additionally, streets and sidewalks are typically treated with salts and other chemicals that are very harmful to dogs. 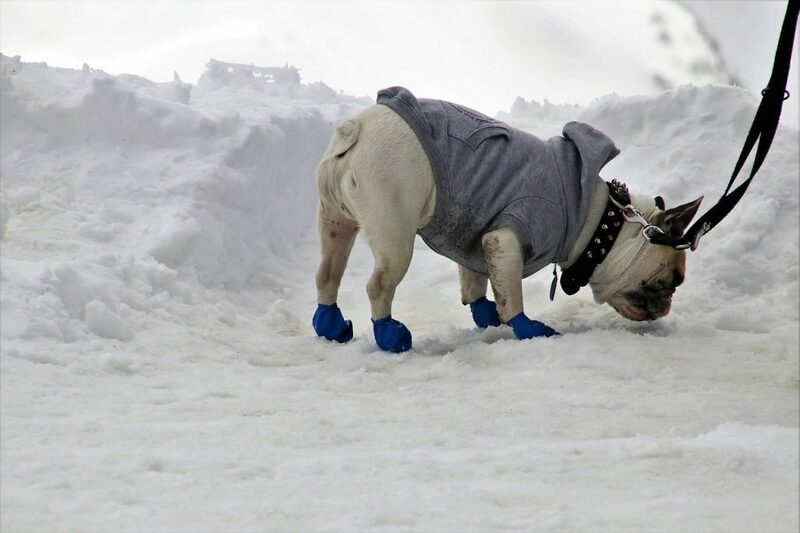 Protecting their feet using dog boots will keep their paws from the excessive drying, cracking, or even burning that these road salts can cause. 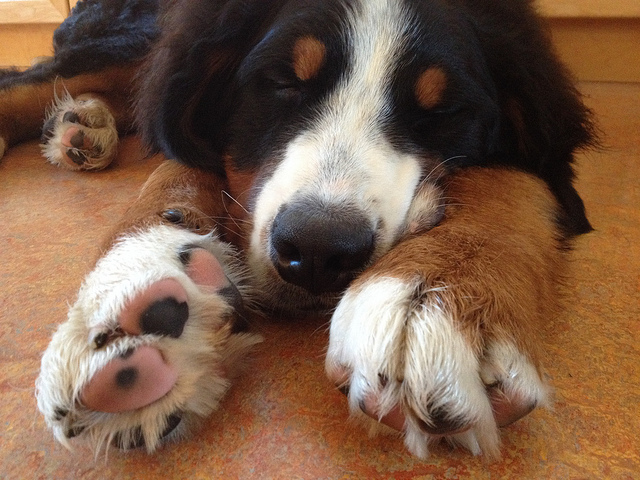 A Bernese Mountain Dog and his hairy paws. Photo by tracydonald. (CC BY 2.0). 5) Practice proper paw care. If you can’t get your dog to tolerate dog boots, the next best thing is to care for their paws properly. Before going out, apply paw wax that will act as a protective layer between your dog’s paws and the ground. Keep in mind, though, that this will wear off. You might need to re-apply, depending on how long you’re out for. When you get home, give your dog’s paws a good rinse before applying some paw cream to further protect them from cracking and drying. Winter conditions are no excuse to loaf about. That goes for both you and your dog. By investing in some dog winter clothes and practicing good paw care, both of you can keep in shape in a stylish, fun, and safe way.